And thousands of cold miles wide. Which you catch off weasels. And painting the sleeping grass. By saying her boat won’t float! Everything wants to be seen! But those are the actual FACTS! Perhaps it should go …. Time to get out of there, mousy! It’s you and me – we’re cyborgs! We can’t digest some foods so we have artificial stomachs – saucepans on the stove. We travel in cars and trains. And your eyes, not your picture, are shared! They wished that blasted cat was dead! What’s in an angel’s head? That extra bit of zing! I was so short ? And say it was from me. Watch out for those vicious knees! Is ever so much fun! It’s something beginning with BEE! And grow a tree again. She’s good at her screaming, is my friend Belinda. Been left to his sad fate! Greedy – but clever …. Its way round the room. That lemmings have bad breath. Looks like this poem needs mending! They’re all that I could see. Oh! What a terrible night! Let them roam the savannah! How many rhinos are left now … ? My face was quite a sight! Raw boiled eggs – yeugh! Of her daddy than of me! And bitter cold and snow is on its way. Two children fighting and playing. I have to make it work. Has anyone seen Cuthbert ? He hasn’t had his cuthtard. I fell flat on my back! When the ground’s covered in snow? When the ground’s covered in snow. To swallow a slug to show I wasn’t scared! Oh no! Don’t eat slugs! I jumped into a shop and hid! Because they cling and want to stay! She’d love to eat them off her plate! She’ll have to have a proper tea. A poem all about bogies and snot. Who does all the washing up? Which is why the duck can’t hold a tune. Would I ask for more ? I’m really not too sure. The trees are going to bed. Not a good idea to win too often, Mum! Because dirty’s far better than clean! Who wants to be clean? Waaah! Complicated, far too much! How can a fish stay clean in dirty water? Amazing when we think about it – how does water hold together in a thin film that floats through air? 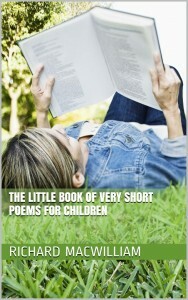 A gentle introduction to poetry with nearly 150 short and silly poems for young children. Includes most of the poems above plus roughly 70 previously unpublished poems. It is amazing.I love it…………. Wonderful poems for the kiddos. These are very easy to learn by heart. wonderful poems this website is amazing. Its great. i like it. I really like this website it has all what you need for your poem homework at school when you are doing a book report on poetry!!!!!!!!!!!!!!!!!!!!!!!!!!!!!!! thank u for making these short and easy poems our small kids learn these poems easily. 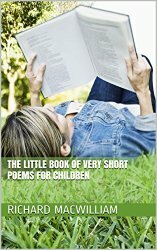 I was searching for short poems for kids. This is the only site that has what I wanted.Poems are short and easy to pronounce.Good job well done. Thanks for some poems. This is helpful for homework. Adorable little poems! Thank you very much! all of these are soooooooooooooooo cute there great for kids!!!!!!!!!!!!!!!! Thankings you for sharing these short nice poems for kids with everybody around the World! These poems are so friggin cute! Love them! And shut up Jelenor. I love them! They are so cute, my kid loves them, even though English is not our mother language! tooo poor . How silly poems……. Your comment is very rude. To say something is gay is a racist comment against gay people. What does it mean anyway? Maybe gay people should start saying o that is so British! Your name here shows how disrespectful you are. Shame on you! Agree, but it’s clearly a child. It’s prevalent in the schools. Doesn’t make it right, but it’s the way life is. Anyone who’s different in any way gets picked on in the playground. @ akeem, those poems are for older children, can i get very short songs and poems for ages less than 3 years. thanks, what a great job. Less than 3? Wow. It’s a long time since I had a three year old – give me some topics. these are really nice poems for kids. but i suggest to add more poems topic like my doll, vegetabels n fruits,my mom n dad, etc. Enjoyed reading all the poems. what nice poems these are for kids my daughter is of 4 yrs i teach her all these poems she also secured 1st prize for it in her school and my daughter’s favourite poem is are martians real? i love these poems:)! My son has gone into the final for his schools poetry competition. Great short and easy to remember for a 6 year old. Party is the poem of choice. Just getting him to say your name a bit harder. But he is practising really hard. I need a good one! those simple poems enhanced my kid’s memory…. thank you…. i needed to learn a poem off by heart for school, wanned to be lazy, typed “short and easy poems for kids” and voila! this miacle came up! i loved the poem “glitter” so i used it! Most of these are great but some are just down right scary!!! I LOVE these poems! They are so fun to read. I have to choose a poem to memorize for school but I can’t choose which one! this website is awesome!!!!!!!! !i like fly. I love the way you make your poems so funny!!!!! also i love your imagination. these poems r realy awesome…………….great keep it up!!!!!!!!!!!!!!!!! My son’s school will be having “Poem in Your Pocket” tomorrow at school & I had been looking for the perfect poem easy enough for a KIndergartner to understand & explain thanks to you I have found many! I cannot wait until my son gets home to decide which poem he will carry in his pocket! very sweet poems wow! wonderful!!!!!!!!!!!! i like the mums instructions very much! Great resource to teach the little ones about poetry! should have a poem on RAIN !!!!!!!!!!!!!!!!! Nice Poems.I worte it for a long project. wooohh..what an interesting poems for preschoolers!!! I wish I could just reply on some of these comments 😛 Some of these are so stupid. No offense. i love these though i’m 12 i still loveeeeeeeeeeeeeeeeeeeee them!!!!!!!!!!!!!!!!!!!!!!!!!!!!!!!!!!!!!!!!!!!!!!!!!! haha.. i love the Martian one! but i do need a short peom for this play i am auditioning for in 2 days! In this text i liked boo glitter and digging in the garden :)! nice poems. helped a lot for my childs elocution contest in school. thanx and please put in more poems. @ Melissa Cool! Hope they grow up liking words! I homeschool 3 children and we use your poetry for our weekly dictation. Thank you for making it available!! My favorite poem is bogies. It makes me laugh out loud and giggle! me and my dad love the poem bogies. I like the poem are martians real that was nice.thanks for the poems!!! These poems were much helpful for me. these 4 lined poems (quatrains) helps alot the second language beginners. kids who learn english as a second language can use these poems to improve their language. your poems are really good do you have a book? at school we are learnng about poems and that is how i found yuor website! i chose 10 poems to use but we only need 1 its going to be a hard dission what one to choose??????????????????????????????????????? I liked the snot peom so much that I emailed it to my son. By the way he is 26! i love these poems they were great for giving me ideas for my english assignment!!! THANX!! simply superb ………. keep it up……enjoyed much…i love it I hadn’t seen the sea before like more …. i loved the poems……. they are excellent…………..the r quite lil funny …. but they r fabulous……………..GOOD !!!!!!!!!!!! the poems are really awesome!! !thanx for the poems…………….my favorate one is spider………….. I absolutely love these poems! :) My favourite one is FLY! thnx 4 da poems ! i luv it ! Cool poems! I use these for my writing homework. Make more funny ones! that was touching. made me think of what my daughter had to deal with duriing my divorce with her mom, but she knows she is loved even that she only gets to see her mom once a week, she knows we all care. but still this poem more parents should read to rethink of the things we do. i love your poems including bogies that makes me laugh. again and again i read it but i still chuckle abit.i have read all the poems on this web page and i am using the cat with a smile or naughty little children for my reciting homework. HOW BORING? Great short poems for kids..only was slightly surprised to see the language in “cat song” when looking through with my seven year old son..?? ?not the sort of thing I was expecting and had to scroll down very quickly. i love short poems, the shortest poem was about that pencil point !!!!!!!! i love these poems, especially the one about divorce. i like “the cat with a smile”. haha run mousy run. Me and my mum love these poems!! They are soooo funny. these are excellent poems for grade ones! These are very good poems. and when i read these poems to my small sister she had fun reading it. Sweet poems! I was searching a few for my kid who just have started to go to school. Thanks for such cool peoms! very nice! Thanks for the poems! All short stories and other works are copyright Richard Macwilliam and may not be copied, distributed, displayed, performed, built upon or used for commercial purposes without the express permission of the author. Schools: you don’t need to contact me about using any of the poems (I get regular requests) unless you plan to use the work commercially. And feel free to use any of the short stories in class or for projects or things like that.